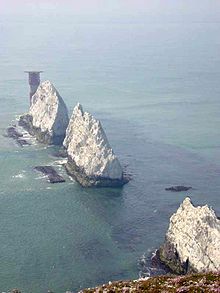 The Needles, situatit off the Isle o Wight, are pairt o the extensive Soothren Ingland Cauk Formation. Cauk is a saft, white, porous, sedimentary carbonate rock, a form o limestane componed o the mineral calcite. This page wis last eeditit on 23 Apryle 2017, at 03:28.